The Little Boy atomic bomb was detonated over the Japanese city of Hiroshima on 6 August 1945. Exploding with a yield equivalent to 12,500 tonnes of TNT, the blast and thermal wave of the bomb destroyed nearly 50,000 buildings and killed approximately 75,000 people. 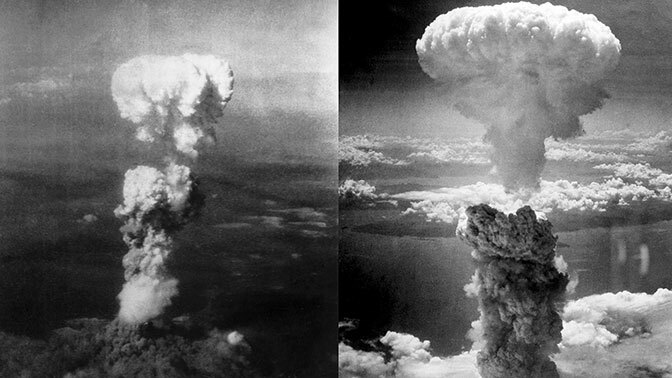 Detonation of the "Fat Man" atomic bomb over Nagasaki occurred on 9 August 1945. The role of the bombings in Japan's surrender and the U.S.'s ethical justification for them has been the subject of scholarly and popular debate for decades. J. Samuel Walker suggests that "the controversy over the use of the bomb seems certain to continue". After the bombings of Hiroshima and Nagasaki, the world's nuclear weapons stockpiles grew, and nuclear weapons have been detonated on over two thousand occasions for testing and demonstration purposes. Countries known to have detonated nuclear weapons—and that acknowledge possessing such weapons—are (chronologically) the United States, the Soviet Union (succeeded as a nuclear power by Russia), the United Kingdom, France, the People's Republic of China, India, Pakistan, and North Korea. Various American government officials, who were in office during the Cold War period, are now advocating the elimination of nuclear weapons. These officials include Henry Kissinger, George Shultz, Sam Nunn, and William Perry. In January 2010, Lawrence M. Krauss stated that "no issue carries more importance to the long-term health and security of humanity than the effort to reduce, and perhaps one day, rid the world of nuclear weapons".